TUAW Poll: What Apple product are you going to buy with your tax refund? 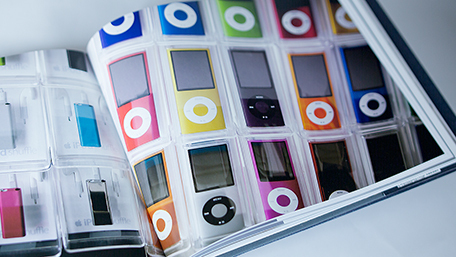 A recently self-published book captures most of Apple's products in one eye-catching place. This photography book is lean on text, but large on photographs of everything you've ever loved from the company that was forecast to fail. The aptly named, Iconic: A Photographic Tribute to Apple Innovation, is the brainstorm of Australian native Jonathan Zufi, who collected 500-plus Apple products over the last four years. He captured more than 150,000 product shots in his photographic studio in Atlanta, Ga., to complete this "photographic shrine," as described by Betsy McKay at the Wall Street Journal. The simple silver-gray cover with black writing and a power button inserted in the letter "o" presents a subtle visage, just like the first 20 years of Apple's advertising. The book includes beautifully captured products of almost every device ever produced by Apple in stunning color photography. The 326-page coffee table book includes six chapters: Desktops, Portables, Peripherals, iDevices, Prototypes and Packaging. Each chapter includes an introduction from a different luminary, commentator or influencer in the Apple community, such as Daniel Kottke (Apple employee #12, whose signature graces the original Macintosh interior case); Chet Pipkin, CEO of Belkin International; architect Neal Pann (who was once kind enough to lend me a Powerbook G4 at Macworld Expo when mine suddenly died); ZDNet columnist and system administrator Kenneth Hess; and a number of other well-known and not so well-known Apple fans. The book includes a forward written by Steve Wozniak. Zufi chose to self-publish his work of art and created Ridgewood Publishing to do just that. This book is not your average title, mass-produced on recycled paper and destined to yellow, oh no. According to the author, "the 12 x 9.625-inch book is printed on 105 lb. GoldEast matte paper. The dust jacket [is] printed on 105 lb. art gloss [with] film lamination and the endpapers [are] printed on 95 lb. white woodfree, plain white paper. Iconic is Smyth sewn-bound, cased-in, with a square back and head/tail bands. The case materials used [are] Slate Blue binding cloth (Classic Edition) and General Roll Leaf Lustrofoil 'Silver S5' (Special Edition)." That's a pretty amazing product spec sheet for a published book today. I wanted to create a repository where people who also love the company and its products could go and reminisce ... I want people who are a bit younger who think Apple just makes things that start with "i" to know this company used to make clunky printers. The special edition includes an external "custom form-fit book case with a design to celebrate the vintage computing retro form factor of the late '70s and early '80s," which is pictured on the Iconic site. You can order Iconic: The Classic Edition for US$75.00 from the site and pre-order Iconic: The Special Edition for $300.00, which will ship in mid-October.